Five years ago, Catara Dillard didn’t do her own laundry or iron her own clothes back home in Martinsville, Va. Her grandmother even ran bath water for her every night. Today Dillard will graduate from Tidewater Community College with an Associate of Science in Social Sciences. She will study at Sentara Health College in the fall with plans to become a surgical tech. 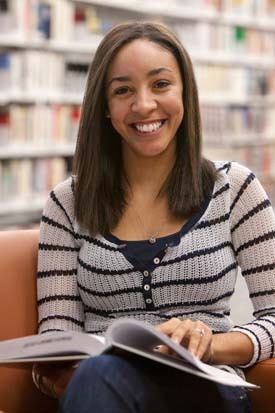 In her last three years at TCC, she has blossomed from a shy, reticent kid to a confident, mature woman – one who doesn’t hesitate to give classroom presentations, campus tours or even the graduation address for TCC’s 57th commencement on Dec. 20 at Old Dominion University’s Ted Constant Convocation Center. “I have come a long way,” she says with pride. Dillard credits her experience at TCC along with the fellowship she found at Sanctuary of Hope Church in making her who she is today. Dillard arrived in Hampton Roads almost accidentally, after being inspired by a family friend who she surprised with a visit. During the visit, she spent one memorable Advent Sunday at the Portsmouth church that is such an integral part of her life today. During the service, three drunken parishioners walked in midway through and sat down in a pew. She expected them to be chased away, but instead they were embraced and welcomed. One sang, “O Holy Night” to her, a rendition she’ll never forget. The man who would later become her fiancé encouraged her to attend TCC as he had. Dillard found a comfort level at the college she never imagined, in part due to the classroom and also thanks to her part-time job in the Office of Student Activities on the Portsmouth Campus. Working under Katina Barnes, Dillard flourished. Initially, Barnes recalls a kid regularly in basketball shorts who was reserved and unsure of herself.